Ever wonder what's being said over an intercom during a rally? That strange language in the background of rally videos? The instructions are known as "pace notes" and they are read by the co-driver from a book while the two drive as fast as possible through a closed section of road called a "stage." Get it right and you fly down roads you've never seen before. Get it wrong, and not only is your day over, but your car is probably totaled as well. Here's the code to that secret language. In a modern car, you'll most likely walk away from a crash, but it's still serious business. The commands sound strange at first, but once you hear it enough times it becomes second nature. And once you guys know what you're listening for, you can follow along as well. The key is that you are hearing instructions for a few corners ahead — or at least they should be if the driver wants enough warning for the dangers ahead. "R5/CR L3 n.c. 100 R1 tidy into L2 300 !! Jump L2/ kick into R3>"
That translates into the following (which is all the driver hears): "Right 5 over crest, Left 3 don't cut, 100 Right 1 tidy into Left 2, 300 double caution jump, left 2 over kick into right 3 tightens." This video is from Americans Chris Duplessis and Alex Kihurani at Rally Finland 2012. Even when WRC co-drivers use English they are impossible to understand. There are a few different systems used amongst teams. The notes above are based on the Jemba system which is the most common in the United States. All corners are broken into numbers 1-6 with a 1 being a hairpin and a 6 practically a straightaway. Some teams use a +/- modifier which is similar to sharps and flats in music or your report card in school. A 4+ is slightly faster than a 4 but not as fast as a 5-. Many teams get rid of most of the modifiers as it's too much to get out during a short period of time, especially on tight, fast stages that have tons of notes to be read. The Jemba system is produced by a computer which is run through the stage in the back seat of a car. The computer records all the G loadings and accelerometer data and after some manual inputs the computer prints out the books drivers get when you register for a rally. The nice thing is that nearly every feature is noted, which is why teams will cross out a bunch of irrelevant information to make the language simpler for the driver to follow at speed. You know what to cross out if you go to "recce" or reconnaissance, where you get to run the thru the stages at the legal speed limit and make adjustments to the notes. 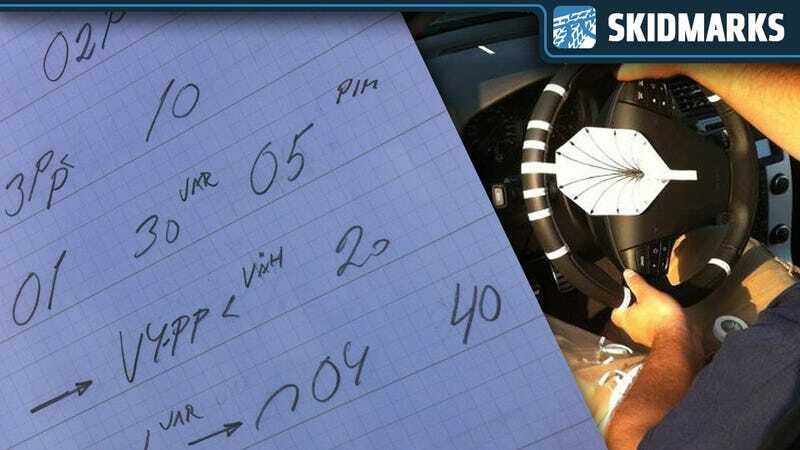 But even without Recce, an experienced co-driver can look at a set of notes and determine what is probably not necessary. There are also things in the notes that help the codriver maintain his place or allow you to regain your place if you get lost. The driver doesn't always need to hear these notes, like a note for a bridge, unless it's narrow, after a high speed corner, slippery, or unusual — it's just a bridge. A whole section of 5's or 6's can be replaced with flat for 1000. Or something like that. "One block square right, two blocks left, right a tea green house, one block right, don't cut (there was a mean storm grate I didn't want to hit)"
We were able to rewrite the whole set of notes because the thing took place in a regular neighborhood and it was easier to call distances by blocks instead of using the "Tulips," which is a different style of notes. Oh, and our intercom had Bluetooth which I paired to my phone so we called Mike Spinelli and left all our random pacenotes on his voicemail for fun! The point is that the system is irrelevant as long as you are getting consistent information about what lies ahead in a timely manner that is easy to understand at high speed. Other systems of notes are actually more about the pace of the road. If Jemba describes the road ahead, other systems describe how fast you should be going or what gear you should be in. So instead of telling you there is a certain degree corner ahead and letting you determine the speed, the notes will tell you to keep your foot on the gas and then tell you when you should start to slow down, sometimes by dictating the gear the transmission should be in for a particular corner or section. No matter which version you use, pacenotes give the driver a view of the road ahead without being able to see it. They allow the driver to run flat out over a blind crest because he knows it's a straightway on the other side. They also provide guidance on driving style and where to place the car for the corner ahead. For example, the "Don't Cut" command which means don't cut across the apex of the turn, leave some room in the middle of the corner because there's going to be a boulder or a tree or something that protrudes ever so slightly into the road or the inside edge of the corner. "Tidy" means don't hang it out. Keep the car clean in the center of the road thru the next section. It could be because of ruts on either side or little drainage walls like in the mountains at WRC Mexico. Everyone focuses on the driver in rally but in many ways, the pace notes and co-driver are far more critical. Drivers make little mistakes all the time, but one little mistake by the person in the other seat and the driver launches the car off a cliff, or into the side of the mountain, as I did at Pikes Peak in 2011 when my co-driver turned two pages at once. As a rally driver you have to trust your co-driver more than anything, even more than the look of the road ahead. If they tell you it's flat out, you better be flat out — but they also better be right! If you don't listen to your co-driver, you'll be slow. It would be different if no team had notes and every crest has to be taken with caution. But if someone has notes and you don't, you don't stand a chance. Many say the difference between notes and no notes is a 20% increase in your time for the stage. I think it depends on the terrain, but the numbers seem to support that percentage. Even more to the point, NASA Rally Sport recently started letting drivers run without co-drivers at their stage rallies, and their times are roughly 20% off the other drivers. It's difficult to get a direct comparison as the cars are slightly different and the driver's experience varies, but there's no question that co-drivers and pacenotes are the key to fast rally times. Hopefully this makes it easier to understand all those rally videos on YouTube. It's a huge language to explain, but these are the basics. If I missed something or you guys have a question, ask away in Kinja and I'll do my best to answer!